The rain gently fell through the trees as I sat on the front porch enjoying the wet smell of the forest on a cool Sunday morning. My eyes were puffy from tears, restless sleep, and brain fatigue. My heart swelled with pleasure from watching women engage in worship, scripture, and community, but my spirit felt exposed and vulnerable after pouring out all I had thought through, written out, and prepared for leading up to the retreat. Recounting the surprise stories that pop into my head as I speak and the words that come to mind during each session is always an interesting part of the retreat aftermath. Confusion and thought chaos often plague me even to the point of not being really sure what I said apart from the used pages of leftover notes I can hold and re-read. This past weekend I let it all hang out as I stood in front of 55 of my closest friends. They heard my heart and words, but they are given the responsibility to translate and apply. It feels freeing, yet eerily ambiguous. Should I clarify? Did it make sense? Did I point to Jesus? How in the world do preachers give of their hearts week after week after week? I've asked Chad several times. He just smiles at me like I'm a silly head. Maybe I am a silly head. Maybe if I was sharing week after week after week I would get used to the exposure or maybe not even think twice about it. Maybe. I'm not really interested in finding out. Retreat de Moxie is my favorite. The opportunity to speak to the women of my church, to challenge them, to know some of their stories, to make them laugh, and to watch them deal with Jesus blows me away. I love it. The truth be told I would love the opportunity to speak to women more often, but it hasn't been part of my life just yet. How do you do that anyway? "Hello. My name is Angel. You've never heard of me, but I want to speak to your group." Duh. Um, no? 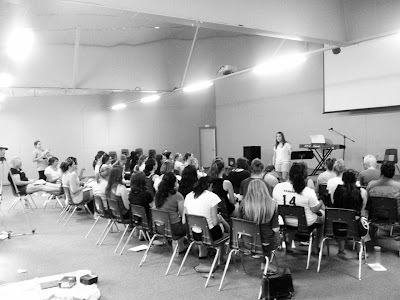 So I will take the opportunity year after year, as long as I feel okayed by Jesus, to speak at our women's retreat. And like I said in my last post, this is not some church lady, stereotypical, paper flower making, super sweet, mamsy-pamsy women's retreat. We get down to some serious Jesus business. Just like it should be. Thanks for the great photo, Angela! I took many hours scratching out notes through three significant passages of scripture. Today I tore the pages out of my notebook to put into the recycle and it felt a bit like when you cook Thanksgiving meal for hours and it only takes five minutes to eat. All the handwritten yellow pages turned into four neatly typed organized five to six point sessions. All the hours of study and writing turned into four one hour sessions. My prayer is that the thoughts and points will resonate with each woman who attended the retreat, that they will think of Mary and Martha differently than they ever have, that they will respond to Jesus as a disciple with a hearty welcome into the deep places of their lives. I learned a few things over this retreat, too. In honor of my friend, Tori, I will share them with you in bullet format. It is important to give women landmarks for major turns when giving directions, not just highway numbers. The work of ministry is meeting people where they are...going with them...to where God wants them to be. Jesus responds to us with compassion, insight, clarity, and enough. If you bring an extra giant bag of peanut butter M&M's they will be gone in less than 24 hours. Speaking about Jesus being the "I AM" will move women in powerful ways. Jesus as the Resurrection and the Life is a foundational, profound, mystery of our faith! 99% of women scream or squeak when they jump off a platform to zip line. We do not always have the luxury of privacy in our faith. True that. What Jesus has planned to do in our hearts is far greater than what he has planned to do in our circumstances! If you accidentally say "sh*t" in a session when you mean to say "strips" your face will turn red and people will laugh. Loudly. Mary and Martha weeping is not the same word used for Jesus weeping. "Jesus wept" is so misunderstood in the church. Often we focus on what is rotting, decomposing, or being eaten by worms in our life instead of Jesus. Our focus should be on Jesus, not our reputation or our own contrived ideas of justice. If you say something you want to clarify, if you truly love people and they know your heart, they will be extraordinarily gracious and loving towards you. 55 women singing Oceans at the top of their lungs promotes huge giant goose bumps. I still cry easily when my brain gets fatigued, but I'm doing way better than I was last year at this time. You think you can love a group of people so much and then you get smacked up in the head with more love and loyalty that you could ever imagine. What are you thinking about these days? If you participated in Retreat de Moxie, what is one serious thing you learned and one funny thing you learned? Do you have any thoughts about any of my bullet points? Please share. You all know comments are my love language. This retreat the Lord showed me that people pleasing is making me ineffective in sharing the gospel with others. I will not be distracted by the eyes and thoughts of others; my aim is to please the Lord. really struck by this response of Jesus. His outrage is full of grief and compassion--a tone that lacks in my own anger (towards good things). I want to really dive into understanding His compassion and grief that lay foundations of action! Beautiful and inspiring! Like you! While there were so, so many good points I'm still pondering individually, I was overwhelmed with Jesus' goodness toward me this weekend (and I don't use the term 'overwhelmed' lightly here.) He is compassionate and loving even in his rebuke and so patient. My heart could burst with thankfulness! Also, I was reminded that if a group of women need to be somewhere at 8:45, Emily and Tia will be there at 8:15 ready to go. :) I blame it on our excitement. The one take away that I am working on currently is simplifying my walk to a relationship with Jesus where He moves and I respond. I have let distractions/to dos/fears/real life issues overcomplicate it, and make my responses to Him a bit cold. That perspective has graced me with peace and freedom, hopefully a total refreshment for our relationship. Angel, I so enjoyed this past weekend! Thank you so much for sharing your heart with us. There was so much that I received during the weekend. A few things that stood out are: 1. Give people the benefit of the doubt 2. The definition of ministry-WOW! 3. (And most importantly for this weekend/season of my life) What Jesus has planned to do in our hearts is far greater than what he has planned to do in our circumstances! I am so glad that my best friend cornered me!